Japan suffers from tsunami disaster frequently. Thus, tsunami research and countermeasure began in Japan, first in the world. After 1960 Chilean Tsunami, it was possible to construct seawalls and coastal dikes at damaged areas by the high economical growth and the technological progress. Many people, including researchers, began to believe that there would be no threat of tsunami, when the 1968 Tokachi-Oki Earthquake Tsunami was perfectly prevented by the seawalls constructed after the Chilean Tsunami attack. However, Dr. Shuto continued his tsunami research, because he could not forget a local resident’s talk, “such a small one (Chilean Tsunami) is just a baby, in comparison with the Meiji and Showa Great Tsunamis”. This talk was proved by the 1983 Japan Sea Earthquake Tsunami. Dr. Shuto and his colleagues had already developed the numerical method to solve the propagation and runup of a tsunami prior to the Japan Sea Earthquake Tsunami. It enabled them to elucidate the mechanism of the tsunami. 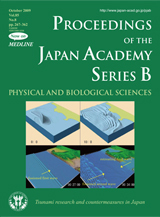 The upper-left figure of cover illustration is the initial tsunami profile (same as Fig.3(b) in the article), the lower left figure shows the soliton fission of the first wave, and the lower right figure shows that the second wave arrived when the first wave was still retreating. These phenomena were observed actually and recorded in videos and photos (e.g., ‘tsunami digital library’, at http://tsunami.dbms.cs.gunma-u.ac.jp/). This numerical method became UNESCO’s standard one and was transfered to 22 different countries. It is still used to predict tsunami damages and to make hazard maps. History of tsunami research and countermeasures in Japan is reviewed in the article on page 267-275 of this issue. By the 2004 Sumatra Earthquake and Indian Ocean Tsunami, tsunami threat has been recognized in the world. The lessons from Japanese experiences might be valuable for all over the world.